Taos Ski Valley offers over 300 inches of average annual snowfall, 300 days of sunshine and more than 1,200 skiable acres. Located 20 miles north of Taos, 72 miles north of Santa Fe and 150 miles north of Albuquerque, this northern New Mexico ski area offers a relaxed, friendly atmosphere, breathtaking views and exhilarating terrain for every ability level. Private flights into Taos Regional Airport are an option, as well as commercial flights into Santa Fe and Albuquerque. The Village of Taos Ski Valley sits at a base elevation of 9,200 feet and offers year-round activities including summer mountain biking, hiking and scenic lift rides for those in search of a view. During the ski season, visitors can access the ski areas 3,281 feet of vertical via 15 lifts and 110 trails. Taos’s Kachina Peak provides stunning views from its summit elevation of 12,481 feet. The resort's slopeside Blake Hotel at Taos Ski Valley, which opened in 2017, includes an exquisite art collection and decor, sophisticated rooms, inspired spa and attentive customer service. 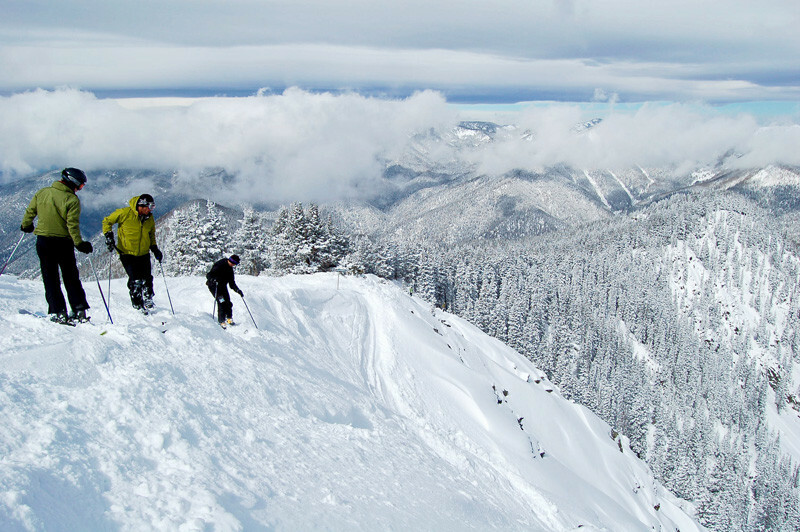 Taos Ski Valley is a strong intermediate and advanced mountain with over half of marked runs being advanced or expert. For those looking to make some untouched powder turns, head to the top of Kachina Peak. The mountain towers over the resort at 12,481 feet and offers some of the finest advanced to expert terrain in North America. Taos typically receives more snow than its New Mexican neighbors receiving over 300 inches on average annually. The snow quality is light and dry and makes for excellent powder days. The resort does not receive too much skier traffic and powder stashes can go hours without being touched. Check out Taos’ longest run Honeysuckle and make sure to stop at the Bavarian Lodge deck for some German beer and hot goulash. Taos Ski Valley exists in large part to the efforts of Erine and Rhoda Blake. The two found the area and lived out of a camper at the base in order to build the ski area. The first lift was constructed in 1956 by Ernie, 16 men from Taos Pueblo and a mule named Lightening.